In the Belgian city Ghent an eight metre high biblical Golden Calf coated with 24-carat gold foil took the lead in a procession of artists, the Clown Army, samba dancers and citizens. 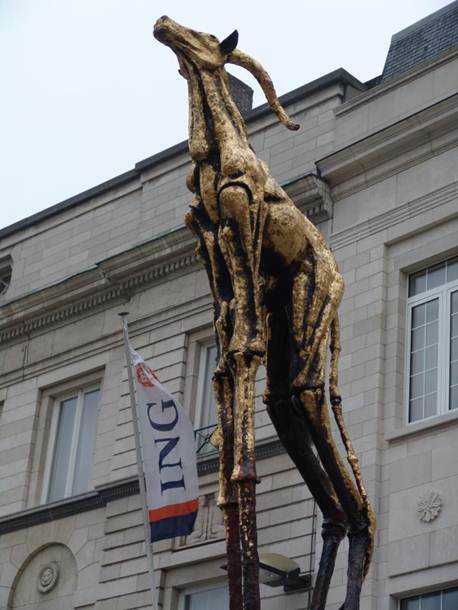 Belgian campaigner Mathias Bienstman said: One can see the Golden Calf as a symbol of the idolatry of return and profit. The sculpture will call the banks to account. Why our savings go to weapons, dictators, sweatshops and other unethical investments? HERE you find plenty of photos of the sculpture. Click HERE to see indymedia’s video about the event.